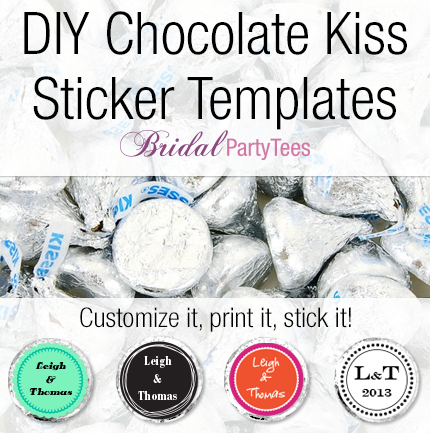 Customize your own chocolate kiss stickers for the perfect wedding favor or for the bridal shower. We’ve made 4 templates for you to choose from. You can change the text, the font style and even the background color in Microsoft Word. Open the template in Microsoft Word. Change the text, font or background color. Print the labels on an inkjet or laser printer. The templates are formatted for 4″x6″, so make sure to adjust your printer’s paper guide to fit the sticker page. Choose the “label” paper option and correct size under your printer presets. Make sure the sticker sheet fits snugly into the adjustable tray or feeder. If you have alignment issues you can play with the margins under: format>document. 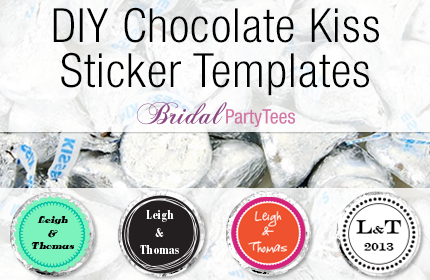 Place your customized stickers on the back of chocolate kisses or use them on other items! Okay everyone, I hope you are ready for the latest free templates! I am really excited about these. I have been thinking a lot about favors and how they can be so expensive. That’s why I created these templates. These are labels for Tic-Tac boxes. I created the labels in Microsoft Word, so they would be easy to edit. 1. Peel off the original Tic-Tac label. You may need to use a warm wash cloth to get all the glue off but make sure you don’t get any water in the box. 2. Choose from one of the Bridal Party Tees design templates. You can edit the text in Microsoft Word. 5. Peel off back and place on the bottle in the desired location. This label is sized to fit on the front or back of the Tic-Tac box. 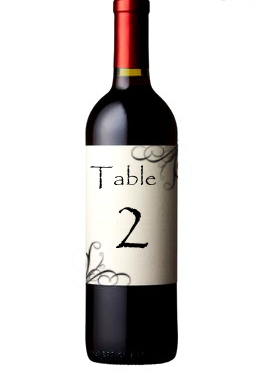 Brides, we’ve updated this post with great wine label design templates that you can edit yourselves! See the DIY instructions and files below. 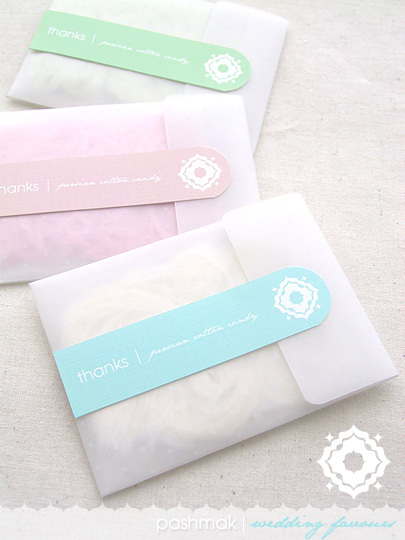 I am absolutely swooning over these Persian Cotton Candy favors from Eat Drink Chic! Not only are these favors perfectly packaged, they are filled with an exotic treat! Persian Cotton Candy, which is also know as Fairy Floss or “Pashmak”, is a gourmet cotton candy that resembles soft wisps of hair. That is why it looks so awesome in these translucent paper envelopes! Persian Cotton Candy is available in various colors and flavors are filled including Rose, Pistachio, and Vanilla. Any of these flavors would make for a wonderful treat, that is sure to make a lasting impression on your guests! Head on over to Eat Drink Chic and download a template for these super cute envelopes and labels. Plus, you will find step by step directions to help you through the whole project. Check it out! 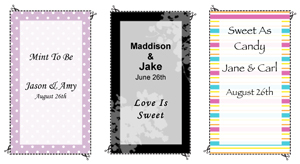 I have to say that I am simply obsessed with all the templates you can find on the Wedding Chicks blog. 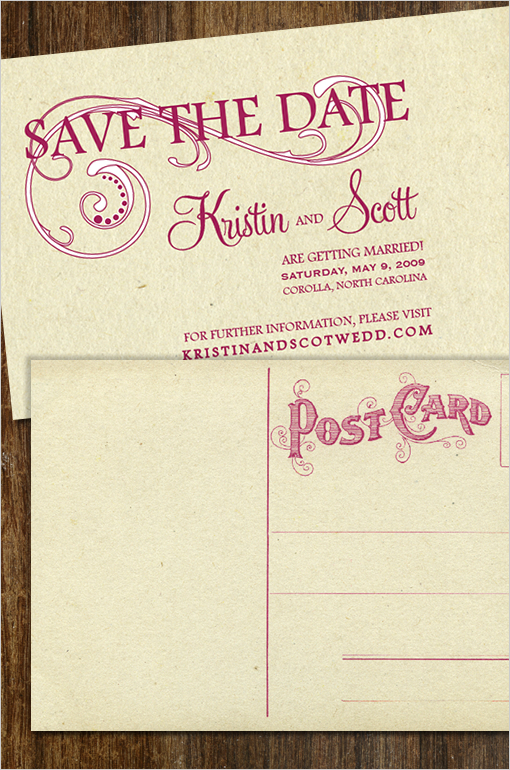 Like this breathtaking Save the Date postcard. This is such a fun and unique save the date that guests will really enjoy. I also, love the vintage feel of the postcard. I am sure all of you vintage lovers are simply swooning. I know I was! To get this template simply click here to be re-directed to the Wedding Chicks blog! Are you having an ice cream bar at your wedding? If so, check out these super cute labels from Eat Drink Chic. I LOVE them! I don’t think I need to say anymore. They simply speak for themselves! To download these cute labels click here to be redirected to Eat Drink Chic. Here is another fabulous template from Martha Stewart. To create this favor cone you just need the favor cone template and directions, crate paper, card stock, a high quality printer, ribbon, and some goodies to stuff in the cone. These make an absolutely gorgeous favors. Stuff them with candies, nuts, or other goodies. These would also make great holders for bird seed or rose petals for your grand exit. The possibilities are endless! Have fun and enjoy. To get the directions and template, simply click here. Get the Template and Directions! I love Style Me Pretty! Abby features the most fabulous weddings and great DIY projects. 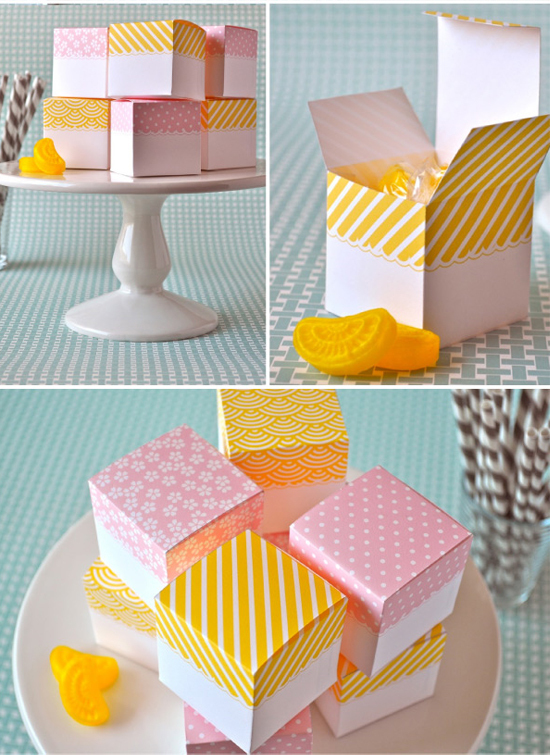 This is a simply adorable favor box idea that was created by the Style Me Pretty DIY guru Kathleen. She does wonderful work. Don’t you think? To get the pattern and directions for this pretty little design simply click here to be re-directed to the Style Me Pretty website. The Wedding Chicks have some of the most gorgeous ideas featured on their site. Take these macaroon thank you bags for example. 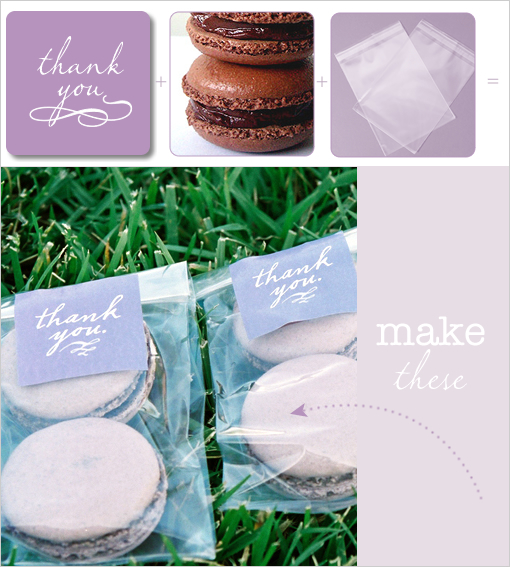 I love how the macaroons are the same color as the wedding colors and the thank you stickers are precious. You can get the full instructions to make these cute favor bags and the sticker templates by clicking here. Enjoy! Are these not precious? Everything from Eat Drink Chic is simply lovely! 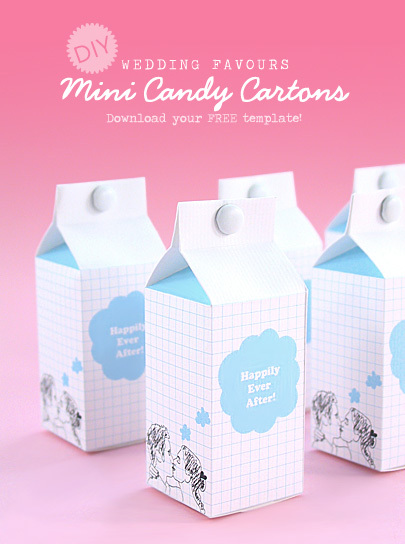 Especially these milk carton favor boxes. I love how these boxes are fun and have a touch of whimsy. The kissing couple with the speech bubble reminds me of a super classy comic strip. I love it! 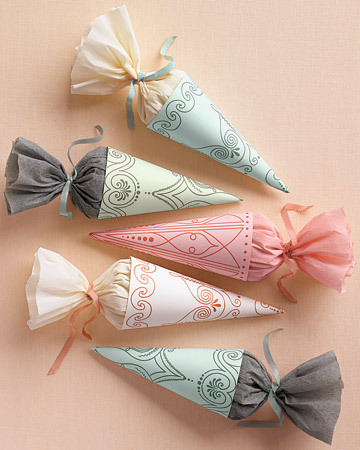 These favors are sure to strike a conversation at your wedding, and I am sure no one will leave these behind! To get the template for these favors and step-by-step directions click here to be re-directed to Eat Drink Chic!